Summary: Eighty-year-old Dora, the narrator of a story that began a half century earlier, is bonding with an unlikely set of friends, including Jackie Hart, a restless middle-aged wife and mother from Boston, who gets into all sorts of trouble when her family moves to a small, sleepy town in Collier County, Florida, circa 1962. With humor and insight the novel chronicles the awkward North-South cultural divide as Jackie, this hapless but charming “Yankee,” looks for some excitement in her life by accepting an opportunity to host a local radio show where she creates a mysterious, late-night persona, “Miss Dreamsville,” and by launching a reading group—the Collier County Women’s Literary Society—thus sending the conservative and racially segregated town into uproar. The only townspeople who venture to join are regarded as outsiders at best—a young gay man, a divorced woman, a poet, and a young black woman who dreams of going to college. You might remember how excited I was after attending the 2012 BEA. Not only do I like catching up with my blogger and publisher friends, but I also learned about all of the upcoming fall releases that everyone was talking about. 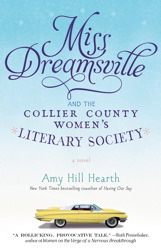 It was at a a special panel hosted by Carol Fitzgerald of ReadingGroupGuides.com where I first heard about MISS DREAMSVILLE AND THE COLLIER COUNTY WOMEN'S LITERARY SOCIETY by Amy Hill Hearth; and I immediately knew I wanted to read it. I love Southern fiction and the book's description made it sound a bit like a Fannie Flagg novel -- and I loved Ms. Flagg's books! I was hoping that MISS DREAMSVILLE AND THE COLLIER COUNTY WOMEN'S LITERARY SOCIETY (from now on to be known as MDATCCWLS) would be like a big old dish of mac 'n cheese -- pure comfort food for the soul. And for the most part, it was a very entertaining read! At its heart, MDATCCWLS is story about a misfit group of friends that takes place in 1962 in Collier County, Florida. When Jackie Hart, a bored mother and wife, moves to this small town from Boston, she definitely stirs up some trouble in this conservative Southern town. She secretly begins hosting a local radio show as "Miss Dreamsville" that has everyone talking; and she also starts a reading group which attracts a few outsiders including a gay man, a divorced woman, an ex-prisoner, and a young black woman. Through this unlikely friendship, all the members of the "literary society" finally find a place where they feel as if they belong. You can probably tell from my brief description that MDATCCWLS is a heartwarming novel about the real meaning of friendship and acceptance. The story and the characters were very entertaining, and at times absolutely hilarious; and while parts of the book were a little predictable, I enjoyed it a great deal. I don't know that I'd go so far as to say I loved it, and I do think the story might make a better movie than a book (which I almost never say!) In fact, I thought the entire book kind of read like a movie to me -- if that makes any sense. In a novel like MDATCCWLS, I think the characters have to be crucial element of the story; and Ms. Hearth most definitely created a unique cast of characters. Each member of the Collier County Women's Literary Society were outsiders, albeit in very different ways, in this typical 1960s Southern town; and they were all extremely likable to my as a reader. I loved how much each person blossomed once they found a group of friends who were willing to accept them, and it was wonderful to see how they all had something unique to offer the group. Needless to say, the messages in this novel were extremely touching. The story is told by Dora, an eighty year old woman who was once a member of the reading group; and I loved her insight into the events that took place about fifty years ago. While I was definitely intrigued by Jackie and her ability to stir up things in this small town, I think Dora was the perfect narrator for the story. I admit that there were times when I wanted to hear from Jackie directly; however, by the end of the novel, I abandoned those thoughts. Dora was a wonderful storyteller and I loved her voice and her sense of humor. One of the main reasons that I enjoyed MDATCCWLS as much as I did was that it had loads of literary references. I loved hearing what books the group decided to read, and I thought it was interesting to see their various reactions to some of the more controversial picks like THE FEMININE MYSTIQUE. On a broader level, I also enjoyed seeing what books were popular in 1962. It's probably not a surprise that the publisher thinks MDATCCWLS is perfect for book clubs; and I agree that this charming story will provide a lot of food for thought. There is a reading guide available with fifteen questions as well as a few ideas for enhancing your book club discussion. Some of the themes that you might want to discuss include friendship, prejudice/discrimination, racism, honesty, the differences between the North and the South, freedom, acceptance, and dreams. Overall, I think MDATCCWLS was a delightful read and sure to be a favorite with book clubs! We saw her at SIBA! And guess where SIBA was held??? Collier County of course. I actually had her sit at my table at the Moveable Feast and she was giving me all these local fish places to eat on our last night in town. It sounds like one of those books you just want to crawl into. As I shake my head in disgust at myself and my inability to read anything, I will take this book out of the big stack and put it in the small one. This sounds like just the kind of book I love. The author was here but it was an evening event and I wasn't able to make it. I can't wait to read this book! Wow! This sounds like my kind of book. I somehow missed getting a copy but I'll look for it now. I thought this was a delightful read as well. Great review! Sounds so good. I hope ot read it soon.